The most recent one (at the time of writing this post), involves a roofing contractor who was prosecuted after an employee fell through a fragile roof light. The employee was kneeling on a scaffolding board while working on a fragile factory roof when he fell forward, crashed through a roof light and fell 7m onto a pallet stacked with ceramic mugs below. The subsequent HSE investigation found that there was no fall prevention or measures in place to mitigate the consequences of a fall. In an ideal world, the preferred option is to avoid working at height, but as we all know this isn’t always possible, so the next consideration would be to look at methods which could allow work to be carried out without actually stepping onto the roof itself, such as MEWPs. When access is needed from the eaves to the ridge, mesh walkways spread the load across the support battens, giving workers a safer working position. 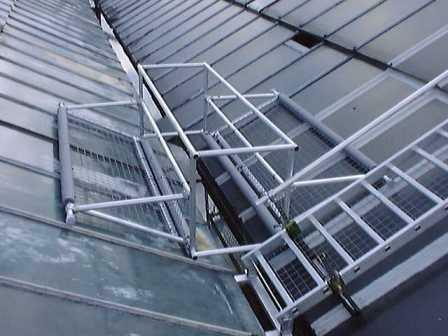 Lightweight mobile walking frames on the other hand are ideal for maintenance of valleys and box gutters on fragile roofs and can provide safe access for up to two people.